Depending on what type of photobook I am creating, I usually try to plan my photobook. But no matter how well I (try to) plan, I always end up with pages in the wrong spot! I am sure it has happened to you too?! I used to solve this problem with lots of use of the CTRL + X (cut) and CTRL + V (paste) keys on my keyboard to move the content from the pages where they were ‘wrong’ to the ‘right’ spot, one-by-one. A lot of work if you have a few photos, some text, maybe a background or so on those pages. Click on the menu ‘Page’. Select the option ‘Rearrange Pages…’. The ‘Rearrange Pages…’ box opens. The numbering starts with 3 -4 because that is the first spread. You can’t move the covers around nor can you move the single page at the beginning of the photobook. Select the 2 pages you want to move with your mouse. Simply click on them in the ‘Rearrange Pages…’ box. It will show a blue line around the pages when you have selected them and you can also notice the buttons on the left hand side of the ‘Rearrange Box’ are no longer greyed-out. They are now black and ready to use. Top button – Move the selected 2 pages all the way to the beginning of the photobook. Second button – Move the selected 2 pages before the preceding 2 pages. Third button – Move the selected 2 pages behind the following 2 pages. Last button – Move the selected 2 pages all the way to the end of the photobook. Use the buttons to move the selected 2 pages to the spot where you want them. Repeat for any other spreads that you want to move to another spot in the photobook. As long as you want to move 2 pages (a spread) together it is now so easy to move them around! I hope this has helped you as much as it has me already. 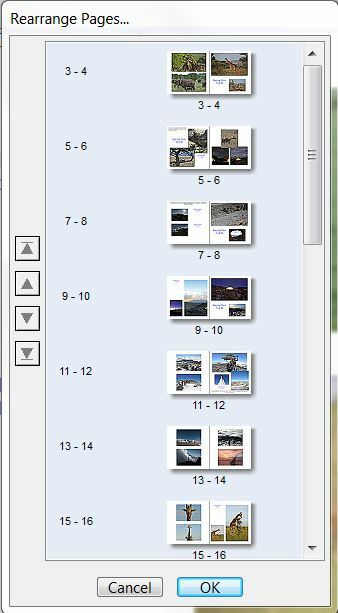 This entry was posted in photobook tips & calendar tips and tagged change, change pages, create photobook, how to, how to rearrange pages, pages, photobook, photobook tips & calendar tips, pix2print, swap. Bookmark the permalink.